I know my regrets may be small but it is still that, a regret. Silence deafened us. I wonder so bad what she was thinking. I tried to break the silence and asked her. I heard her sigh heavily. I immediately regretted saying that after it came out of my mouth. It was too personal, I knew it. Dammit, why couldn’t I just stick to the awkward silence. But then my thoughts were broken by her words. I saw her eyes starting to water, then the tears left her eyes streaming down her face. She wiped her tears away and all I did try and comfort her; I hugged her in attempt to comfort her. I wish it did, I really wish it did. 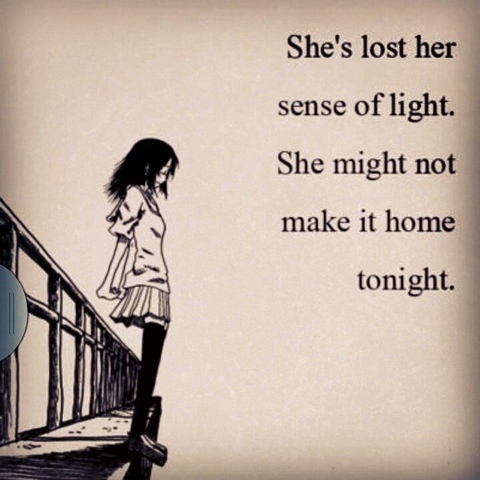 I know a little girl who’s lost her light. She might never make it home tonight. I remember how happy she’d be before. She loves to bring joy to others, she still does, but this time it’s different, it doesn’t make her as happy as it used to. Slowly, I watched her isolate herself, slowly I see this little girl I know become someone I knew. I tried to bring her back but I couldn’t. Its like one day she just started disappearing; like she’s looking for something that she can’t find. I’ve always wondered what happened? No one notices the change. She’d keep her walls up and front strong. She’d smile like nothing was wrong but I know that every time she’d be alone her walls would go down and her true feelings would show. One day I caught her off guard and then I slowly approached her, only to discover how fast she could recover – as if she never removed the mask. This was the day I’ve become curious about her. I watched her from a distance and see her interact with other people; no one sees through her walls but…. me. I wonder why? Why me? Through the months, I slowly started to bring her back. I wanted to free her so badly from this pain. A pain which I never knew where it came from. No one deserves to be suffering through such pain alone, maybe this is the reason why I was the only one who seemed to notice. Slowly, she was coming back. She was becoming the girl I know. But one day, everything fell apart. She started avoiding me again, she stared making up excuses. I’d notice she’d stop eating and she’d be distracted….. Just like before. I started worrying again. Compared to before and now, she’s worse. She started getting thinner, then she’d always be feeling dizzy. She was pale, and the black under her eyes were prominent. This time I have to talk to her,but when? I’ve found the perfect timing and I approached her. She was startled at my sudden appearance. Just for a second there her eyes showed panic and fright. What does that mean? I told her “We need to talk”.